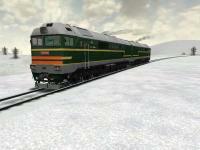 USING THIS DIESEL LOCOMOTIVE 2TE121 ON ANY OTHER SITES WITHOUT PERMISSION OF AUTHORS AND ADMINISTRATORS IS PROHIBITED! ATTENTION! FOR CORRECT USING OF THIS LOCOMOTIVE YOU NEED TO DOWNLOAD CABVIEW 2 FOR 2TE121 AND SOUNDS 2 FOR TEP70 VER. 1.3 OR NEWEST! IT'S NECESSERY USING 2TE121 DIESEL LOCOMOTIVES! The model painted like its prototype 2TE121-023 at 2005. ATTENTION! FOR CORRECT USING OF THIS LOCOMOTIVE YOU NEED TO DOWNLOAD CABVIEW 1 FOR 2TE121 AND SOUNDS 2 FOR TEP70 VER. 1.3 OR NEWEST!